I was excited to see how this day of celebrating neurodiversity turned out. I have always felt it is important to embrace differences and accept people for who they are. My own children fall into this realm and I am proud of them and everything they have accomplished. Unfortunately, I was disheartened to see some of the responses throughout social media. There was a lot of frustration unleashed by autistic people on responses by parents saying they didn’t feel the same way because their child was severely impaired. I can understand and appreciate where these parents are coming from. They want some semblance of normalcy for their child – normal by their perspective may be their child going to the toilet when they have to go. I understand the frustration of autistic people who have been expected to act according to the prevalent social norms. I also understand the negative connotations that come with the words “cure” and “recovery”. Autism isn’t a disease, it’s a neurological condition so this brings a lot of criticism (especially when partnered with untested “cures” such as bleach enemas, chelation and lupron). Where am I going with this? I’m not entirely sure. I do think we all need to be more tolerant of the fact that it is a huge spectrum, with different levels of impairment, severity etc. 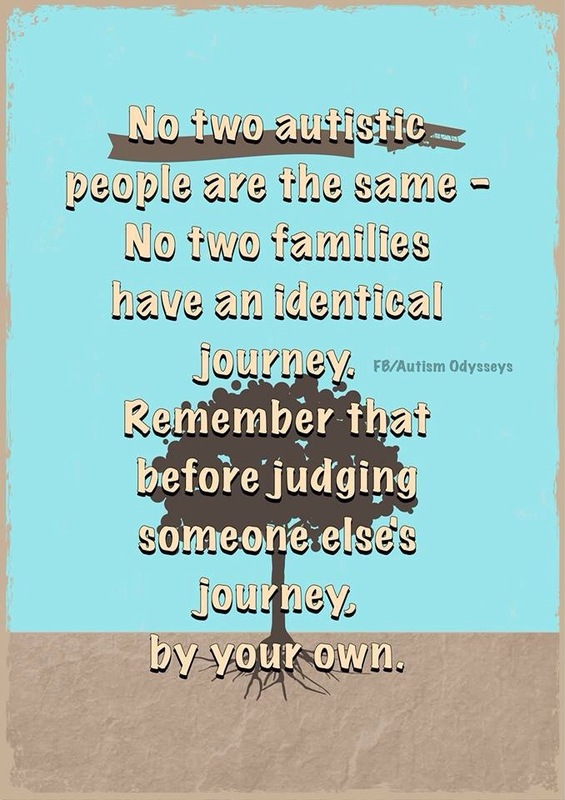 My journey is my journey, and I’m not going to judge anyone else based on what I have experienced. By the same token, if someone thinks they are entitled to judge me based on their own experience? Well, good luck with that. Is this divide enhanced by the removal of Aspergers from the DSM? Or did the Aspergers label cause an expectation of “normalcy”? I don’t have the answers to these questions but I hope to have mutually-respective discussions throughout the next year. I love this! It’s exactly what I’ve been trying to say, but more concise! We can choose to come together or continue to divide. I sincerely hope as a community we come together in our differences.